Dark chocolate laced with cinnamon and covered in coarse sugar. A Nestle product. 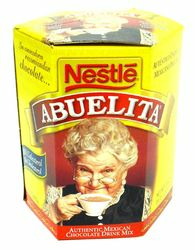 Mexican movie actress Sara Garc�a, Mexico's lovable grandmother, is the original image on the Abuelita Chocolate label. Serve your Mexican Chocolate with churros! To make Mexican hot chocolate, break tablet of Mexican chocolate into pieces and bring it to a simmer with milk. Stir the mixture until the chocolate is melted and well-combined. Mexican chocolate is traditionally beaten to a froth with a wooden implement called "molinillo". You can imitiate the effect by putting a small amount of your chocolate at a time in a blender and briefly pulsing it. Chocolate de mesa Abuelita obscuro con azucar y canela. Disfrute el chocolate Mexicano caliente con churros. Barras redondas de chocolate. Producto de Nestle. Where's finely ground Chocolate Ibarra? I learned to drink Chocolate Ibarra in Guadalajara in 1953 and have used it for the past 65 years, starting with the tablets. When the finely ground version became available a few years ago I began using it -- same flavor but easier preparation. Now the finely ground Ibarra has disappeared from your list, leaving only the Ibarra tablets (or finely ground Abuelita brand, which I won't use). I've tried the finely ground semi--dark version of Ibarra but it costs twice as much! El chocolate Abuelita es mi chocolate preferido! A mi me encanta este chocolate porque tiene el mejor sabor, es fil de hacer, y sobre todo es muy barato. El chocolate Abuelita viene con seis delicias tablillas de chocolate en la caja. Cuando yo quiero hacer un chocolate en leche pongo la leche a hervir. Despu le pongo una media parte de la tablilla dentro de la leche hervida y la revuelvo hast que se derrita. Cuando se revuelva bien lo pongo en mi taza favorita. El sabor del chocolate es auttico, si quieres un chocolate original de Mexico entonces compra este mismo. Tiene la mezcla perfecta y la mejor textura sobre los de m. Las tablillas nomas no se pueden usar para un chocolate en leche pero tambi para preparar postres. Si aplastas las ricas tablillas se pueden usar para hacer pasteles o galletas. Por ejemplo si tienes listo para hacer un pastel de chocolate un ingrediente de m que le puedes echar es el chocolate Abuelita aplastada para que le de m sabor rico. Me encanta que le caja de seis tablillas solo cuesta $3.19 porque es un precio razonable para toda la gente que quiera un chocolate con un sabor auttico buenimo. Its good. Not plain, you can definitely taste cinnamonin it. I'm not sure what that stick was for but i think it's for stirring. The chocolate doesnt dissolve so quickly so what I do is take hot boiling water or milk and put it in the blender, throw the chocolate in after cutting into 4's and blend. Let the chocolate soften from the liquid first. Blend then pour into milk that has been warming on the stove. Top with marshmallows. You have not had Hot Cocoa until you have had Abuelita Mexican Hot Chocolate. The flavor is amazing and so easy to make. Use a Moliniilo to make it frothy! This brand of chocolate is delicious much better than any american style that i can think of buy it..